Chinese Gold Pandas are widely regarded as the third most popular coin in the world, tailing only the American Eagle and Canadian Maple Leaf. These coins are minted exclusively by the People’s Republic of China. As one of the older coins in the grand scheme of things, the first run of the Panda was released in 1982. The Chinese Panda features a new design each and every year, something that only Australian Kangaroos also do. This has created a higher level of collectibility because of the variety of coins that collectors have to chase after. As you might expect, these numerous designs have created many different variables that also add to the collectible aspect of the coin. There are technically five different sizes that this coin is produced in, but the most common versions are 1/10th through 1 oz. The obverse side of Chinese Pandas include a picture of the Temple of Heaven along with some native Chinese writing, which says “People’s Republic of China” when translated to English. On the reverse side, owners will find a panda. The exact type of panda design that you find will depend upon the year of issue, as no two years are the same. As is the case with all nationally issued, government monitored coins, the Gold Panda can be used as actual currency, with denominations found on the coin itself. 1/10th oz. Chinese Gold Pandas are the second smallest version of the coin in circulation, following behind the 1/20th ounce variety. These coins have a total weight of 3.1103 grams, feature a diameter of 17.95 mm, and have a thickness of 1.05 mm. In most circles, this size of the Panda is regarded as the entry level coin that can be obtained with the smallest initial investment. All 1/10th ounce Pandas are worth 50 Yuans if you were to use them for purchases in China. 1/4 oz. Gold Pandas are the first step up from their 1/10th oz. cousins. The true weight of the coins is 7.7758 grams. In terms of actual size, the 1/4 ounce Pandas have a diameter of 21.95 mm and a thickness of 1.53 mm. The quarter ounce Gold Pandas are worth 100 Yuan in actual Chinese currency. If you want to buy a sizable Gold Panda, but don’t want to buy or can’t afford a full ounce coin, the best alternative is the 1/2 oz. coin. These coins have significant value and are one of the most common choices among collectors and investors alike. The diameter of a 1/2 ounce coin is 27.00 mm and the thickness if 1.85 mm. The real weight of this size coin is 15.5515 grams. Face value on half ounce Pandas is 200 Yuan, exactly twice that of 1/4 ounce coins. 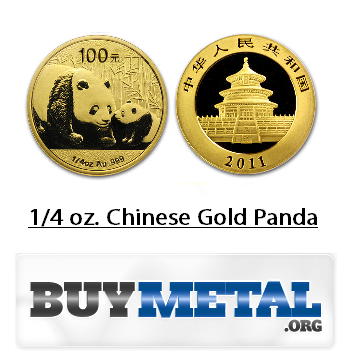 Gold Pandas are available in many different sizes, as evidenced above, but the 1 oz. coins are definitely the most desirable. Aside from having the most inherent value in terms of gold bullion itself, the coins also have the highest demand among collectors. The weight of 1 oz. Panda coins is 31.103 grams, the diameter is 32.05 mm, and the thickness is 2.70 mm. As you might expect, the face value of one ounce coins is also the largest, with each one being worth 500 Yuan. Since this particular coin is so heavily saught after, it is also one of the best investment choices available. Even though you will definitely be subjected to a moderate premium over gold spot price, it will be more than worth it in the long run. As was mentioned previously, this coin is one of the all time favorites among collectors. Adding even a 1/10th oz. coin to your investment portfolio or gold collection will be one of the best decisions you could make. Even though 1 oz. coins are the most expensive due to their weight in gold, they also carry the lowest overall premiums in terms of percentage. If you want to save money on the added value price on Pandas, your best play is to buy the biggest size possible. There is nothing wrong with buying the smaller coins, it simply means that more of your money will be allocated towards the premium vs. the gold itself. Reputable gold dealers will carry Pandas from many years, sometimes every year, and they are not all that difficult to find. Purchase a few Gold Pandas and you will be adding a bit of diversity to your collection and you will undoubtedly reap the rewards when premiums increase over time.